software for hotels, hotel software, hotel management software, booking software, reservations software, software for reservations, software for accommool. With Vladovsoft Hotel you can track all deliveries, sales, reservations and accommodations in your hotel easier than ever. 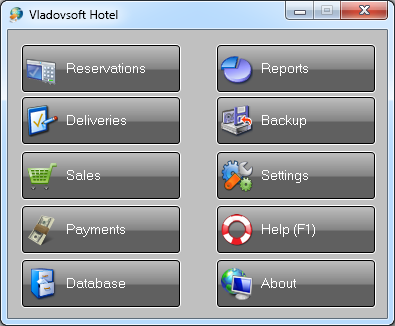 Vladovsoft Hotel is an easy to use, affordable solution for hotel management and control. It lets you keep track of all deliveries, sales, reservations and accommodations in your hotel. The hotel management software has an easy to use reservation module to help you take care of all the bookings. A full set of reports for your hotel's guests, income, expenses, rooms, reservations and many others is also available. When you start the program for the first time enter 'admin' for username and 'admin' for password to log in. Improved user interface and better reservation module. ame and 'admin' for password to log in.